Generally the primary or “baby” teeth become loose on their own and the child can wiggle them out. Occasionally, a primary tooth may not become loose on its own and may block the eruption of its permanent replacement tooth. Roots on a primary tooth are generally smaller than their permanent tooth counterparts. Most children and adults who have a primary tooth removed have a very quick recovery time. 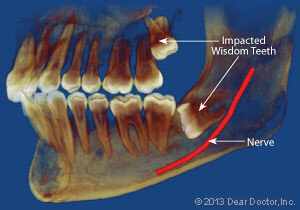 In the absence of periodontal disease or trauma, permanent teeth do not usually become loose on their own. Removal of a permanent tooth will require some modifications of your daily routine. In some situations, it may be best if you do not return to work after having a permanent tooth removed. 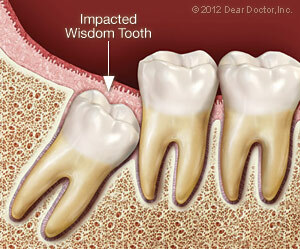 We will give you written post-operative instructions to take home if you have a tooth removed in our office. At your orthodontist’s request or Dr. Steckelberg’s diagnosis, primary and/or permanent teeth may be removed in our office to allow for an improved orthodontic result. This is done with careful consideration of the individual variables present. Sometimes a tooth is not able to be removed without creating a small surgical opening around that tooth. That extra opening can allow for better visualization, as well as removal of any bone that might be trapping your tooth in place. If your tooth requires surgical removal, you may need sutures, or “stitches.” Dependent on the suture material used, you will usually need to return for a quick visit to have your sutures removed one week after your surgery. If appropriate, Dr. Steckelberg does remove some wisdom teeth in our office. A current panoramic X-ray must be utilized in determining if you will need to have an oral surgeon remove your wisdom teeth. If you are taking Coumadin, Warfarin, daily aspirin, or any other type of “blood thinner,” modification may be needed prior to removing a tooth. Make sure to tell us if you are taking one of the newer anti-coagulant medications such as Pradaxa, Eliquis, or Xarelto, which are referred to as "blood slickers". Please make sure to let us know if you are on these medications, so that we can treat you properly. A consultation with your physician, as well as pre-operative blood tests, may be needed to determine the appropriate time for surgery. If you are taking medications from the bisphosphonate drug family, surgical dental treatment may be modified. Examples of these medications are: Actonel (risedronate), Aredia (pamidronate), Boniva (ibandronate), Didronel (etidronate), Fosamax (alendronate), Fosamax Plus D (alendronate), Skelid (tiludronate), and Zometa (zolendronic acid). Medications generally have two names: a brand name and generic name; we have listed the generic name in parentheses. Emerging research suggests increased caution be used before any dental surgical procedure is performed. Research is still in the early stages, but our office is striving to stay on top of this recent discovery. The concern about bisphosphonate emerged due to osteonecrosis of the jaw developing in patients who had invasive dental surgeries performed. The risk of developing osteonecrosis appears to be low, but we need to inform you of the risks and benefits, as well as any alternatives for any surgical procedures before the procedure is started. You can learn more about osteonecrosis and other dental health topics at the American Dental Association website.